Facing foreclosure is a stressful experience. People work for years to save for a home down payment and spend years more paying a mortgage. Homeowners also invest tens of thousands of dollars in home renovations and repairs. A foreclosure complaint threatens to lay all of this hard work to waste. 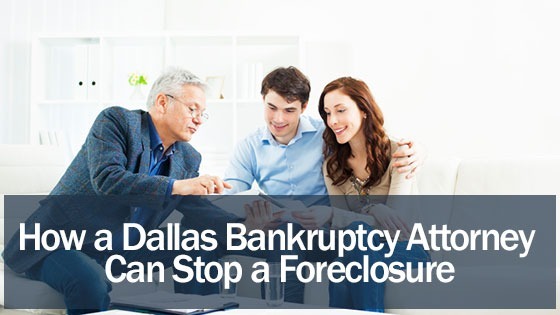 Dallas homeowners should never take a foreclosure lying down. Fighting back is essential to the financial survival of the homeowner and his or her family. If the bank succeeds in foreclosing, the family faces eviction. In addition, equity in the property is generally lost. A Dallas bankruptcy attorney from the Law Offices of David Kohm can provide you expert legal advice pertaining to your possible foreclosure. Homes are sold at auction for below market value. If there is home equity, the end result is the new buyer scooping up the equity from the foreclosed family. In addition, banks charge the foreclosed homeowner for its legal fees. If the balance owed to the bank exceeds what the bank sells the property for at auction, it can obtain a deficiency judgement against the foreclosed party. In addition to being evicted, the former homeowner must pay back the deficiency judgment and all the bank’s legal fees and court costs. There are many ways to legally stop a foreclosure and protect your home and home equity. The best option depends on the stage of the foreclosure and the financial circumstances of the family. Bankruptcy often makes sense because it either saves the home and equity or relieves the family of any further obligations to the bank. A bankruptcy attorney from our Dallas office may be able to help prevent your home from being taken by the bank. The pre-foreclosure stage encompasses the months between when the last mortgage payment was made and when the bank files a foreclosure lawsuit against the owner. During this time, the bank sends letters demanding payment. It may also send information regarding payment plans and options such as a short sale or deed-in-lieu of foreclosure. If the homeowner has no equity and doesn’t want to remain in the home, a short sale of deed-in-lieu may be the most efficient way to dispose of the property; however, if the homeowner has equity or wants to remain in the home, bankruptcy often provides a better alternative. Upon filing bankruptcy, the homeowner receives an automatic stay, which essentially freezes all collection activity, including foreclosure lawsuits. At the minimum, the automatic stay buys the homeowner time. The automatic stay remains in effect until the conclusion of the bankruptcy proceedings. Chapter 13 bankruptcy is often known as the “home saver” bankruptcy. A Chapter 13 protects the homeowner from foreclosure while a debt reorganization plan is proposed to the bankruptcy court. A reorganization plan allows the debtor to repay debts at a reduced, affordable amount. A Chapter 13 protects the homeowner from foreclosure for as long as the payment plan remains in effect. This type of bankruptcy is ideal for wage earners who have equity in their homes and wish to keep the property. For more information on a Chapter 13, contact a bankruptcy attorney. Chapter 7 bankruptcy liquidates all unsecured debts, such as credit cards. Secured debts, such as home mortgages, can be liquidated or reaffirmed. Homeowners who wish to keep their homes can reaffirm the mortgage debt, which means they remain responsible for paying the mortgage once the bankruptcy concludes. For more information on a Chapter 7, contact a bankruptcy attorney. By using either state or federal exemptions, the homeowner can exempt their home equity from liquidation. This means that the homeowner keeps the home and the equity. The automatic stay provides time for the homeowner to make up any back mortgage payments. Because the bankruptcy discharges other debts, the homeowner is able to afford the mortgage payment after bankruptcy. Homeowners who have no equity and are unable to obtain a short sale of deed-in-lieu can protect themselves from a deficiency judgement by going through bankruptcy. A Chapter 7 bankruptcy eliminates any legal responsibility of the homeowner to pay the bank. Call the Law Offices of David Kohm today at any of our convenient locations and get a free consultation. Do Texas Residents Really Need an Attorney to File Bankruptcy?